Pattern Description: A snowflake type hobstar sits on 2 smaller ones, separated by file triangles.Between the columns of hobstars are a rayed arch , and some rope-like lines.The top is serrated and the handle is molded. This pattern was originally called Fernland by Cambridge (a Nearcut design with #2635 assigned) and was made quite extensively in clear pressed glass (not iridized). 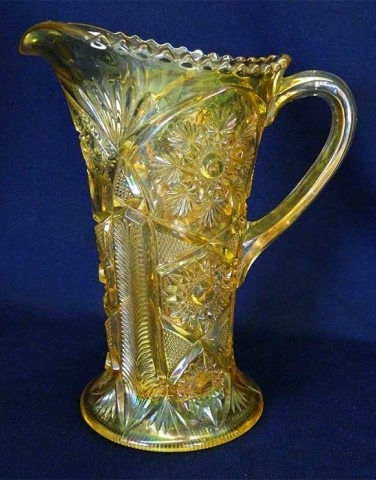 The pitcher is the only reported shape in carnival glass. It stands 8 1/4″ tall and holds approximately 24 ounces. 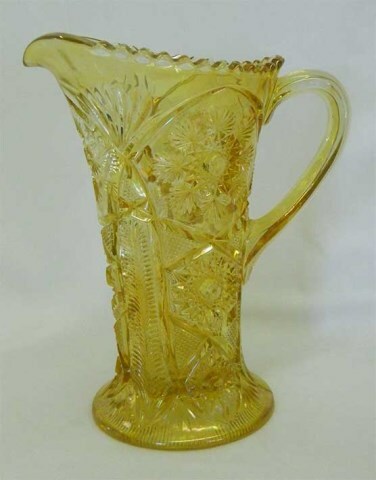 It is easy to see why the pattern name of Snowflake was applied, since the predominent feature in the pattern is a snowflake-like hobstar on the top part of the pitcher. The top is serrated and the handle is molded. The base is slightly domed. There is one legacy sale for a marigold pitcher in 2007 where it sold for $400.